the source of all human beings. the beginning and end. Life. Amanda: Wow. Found this to be a very stunning image. It’s always curious to see how “reflection” photos might come out since there are many images out there which are well ingrained into our minds. Nevertheless, I felt like this still felt unique and it had a silent strength to it that I particularly appreciated. My one suggestion would be in regards to the coloring of the images – the left side is extremely warm, but the right side looks “normal” rather than “cool.” I’m wondering how the contrast would work had you emphasized the editing on the right hand side and done a wash to it. Beatrice: I think it’s a cool concept to show how different lighting can really affect how the photo is perceived. I agree with a couple others that the transition could be smoother and the picture frame (?) is a little distracting and could be edited out. I like the symmetry of the photograph and the contrast of the warm tones versus the cool tones shows different emotions and even different times of the day really well. Fernando: When I first looked at your picture, I spent around 2-3 minutes just trying to figure out whether both sides were the same image or not – it took me that long to realize they were. No matter how much I try, I can’t help but seeing it as “a beginning and an end”. A beginning and an end of a day, a beginning and an end of a relationship, of a project, of a part of your life, or maybe of life itself (a lot of influence by your poem right there!). I really enjoy the way that even though the left and the right side are the same image, they transmit completely different moods: the left side you seems sleepy (to me at least), but ready to face the new day ahead. The right side you seems reflective, tired perhaps, ready to go to bed and face the next day in the morning. It’s amazing how much lighting can change a picture – your project really got me thinking about that, and for us photographers, it’s especially important to keep this in mind. Overall, I really liked your project! My only suggestion would be for you to smoothen transition between the left and right sides of the frame so that it would seem that one image blended into the other. However, that’s only my personal taste however. Horn: I printed your photo to better analyze. I need a lot of time to describe this picture and this is very interesting. Most of the pictures we look at for a few seconds and the story is easy to understand. But yours, it’s different. Take the time to look at the photo, there is a story is to discover with time. The photo looks the same on both sides, but they are different, and that only through lighting. Light can make a sad or joyful photo. The light also acts on a person’s emotions. Jessica: I love the composition of this photo. 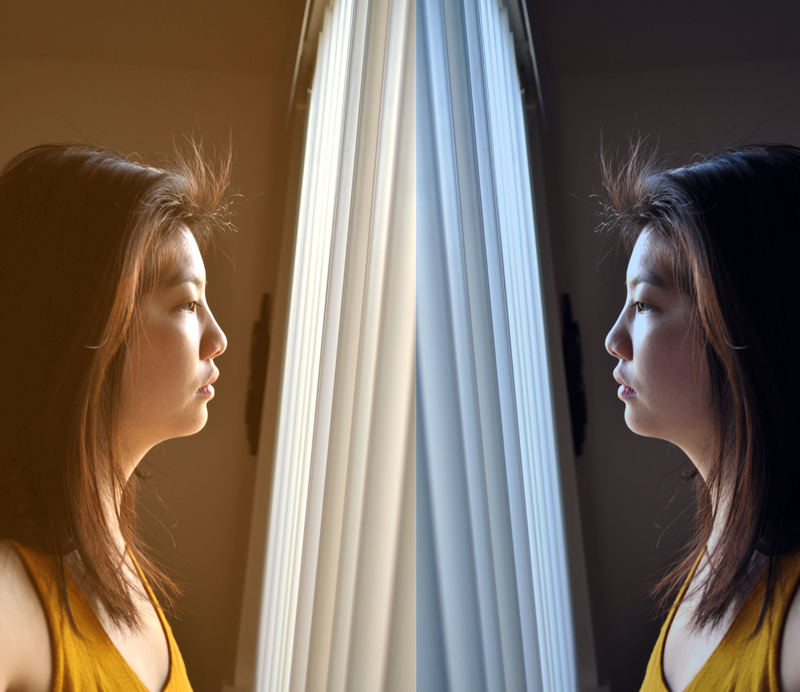 In one sense, you are looking outwards at the light filtering through the window, but in the other, you are looking inwards at a reflection of yourself. I love how expressive your face is too. There is an intensity to your gaze that pulls me right in. However, I don’t have a sense of what specific emotion you are feeling. While it is not necessary for me to know what exact thought you are having, I do wish that I could understand a deeper connection between it and the tone of your poem. Unless ambiguity and pensivity was your purpose? Maya: Jacquelyn — I really enjoyed your photograph for this project. I think it brings just the right amount of drama that really captures the viewers’ interest. It is simple, and the colors are great. I think that you did a excellent job at conveying the fact that individuals are comprised of many different sides, moods, emotions, etc. Stephen: Jacquelyn, you have managed to convey two great independencies in this photo. The right, for me, represents the beginning – the break of dawn – the source. And the left presents refinement and direction.The energy of light is never ending – it can be changed – but always conserved and I think this is really well presented in your mirror! The left, however, has been a bit washed out with orange-ness. A more subtle change could have brought a smoother transition. The light hitting you is really well choreographed and I am now intrigued as to what is beyond the drawn blinds to the light and life outside. A great piece! Posted in #2 - Self Portrait, JacquelynTagged community, jacquelyn, light, mirror image, photo blog, photographer, photography, self portrait, selfie, the photograph collectiveBookmark the permalink.